Just to let folks know that I’ve started another blog, called ‘Mind in Mind’, to focus on the mind and brain books and musings that I write about now and then. I’ve copied some of the posts from here to there to get it started, and will try to keep that material out of Mediated, for the most part. We’ll see how it goes! It may not feel that way right now, but the last 10 years may go down in world history as a big success. That idea may be hard to accept in the United States. After all, it was the decade of 9/11, the wars in Iraq and Afghanistan, and the financial crisis, all dramatic and painful events. But in economic terms, at least, the decade was a remarkably good one for many people around the globe. Nonetheless, despite the positive news in much of the world, it’s questionable whether the decade as a whole has been good for Americans, economically speaking. Median wages have not risen much, if at all, and the costs of the financial crisis and irresponsible fiscal policies have become increasingly obvious. Those facts support a pessimistic interpretation. A lot of my married friends take a vicarious interest in my personal life. It’s usually just nosy, prurient fun, but sometimes smacks of the sort of moralism that H.G. Wells called “jealousy with a halo.” Sometimes it seems sort of starved, like audiences in the Great Depression watching musicals about the glitterati. It’s true that my romantic life has produced some humorous anecdotes, but good stories seldom come from happy experiences. Some of my married friends may envy my freedom in an abstract, daydreamy way, misremembering single life as some sort of pornographic smorgasbord, but I doubt many of them would actually choose to trade places with me. Although they may miss the thrill of sexual novelty, absolutely nobody misses dating. We all make choices about how to live, sometimes feeling good about them, other times feeling perhaps we’ve made a mistake. We can look at our friends’ lives and try to make some comparisons, but in the end it’s pretty impossible to know how other people are really feeling about their own choices. So we carry on, trying to do the best we can, to live with choices we’ve made, to optimize our future outcomes. No do-overs, no rewind! Got up early this morning for a 5K run through downtown Portland, part of the ‘Run for the Cure’ events. I was pleased with my finish of 21:56, not too bad given my fairly lax training. Even better was the fact that my legs felt pretty good during and afterwards. Since June, I’ve been trying to adjust my running style to land on the forefoot, rather than the heel, and after a rather tough month of early attempts (and walks home), it’s starting to pay off. By landing at the forefoot, there’s more of a spring effect on each step. 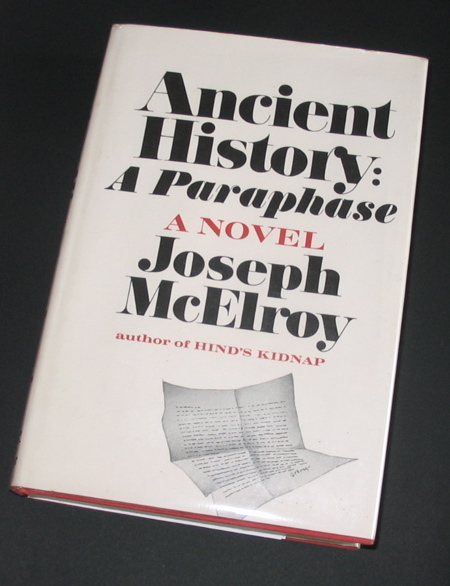 A little while back I picked up a first edition of Joseph McElroy‘s 1971 novel, Ancient History: A Paraphase, his third book. For whatever reason I had it my mind that the title was really Ancient History: A Paraphrase, but a few days back I was looking at the cover and finally saw the true title. But funny enough, I found that others have made the same mistake. 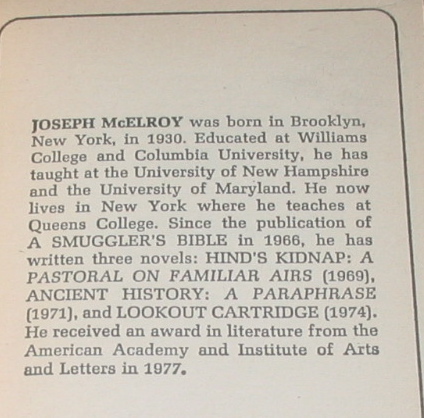 The bio below is from a paperback reprint of his first novel, Smuggler’s Bible. Ancient History is a strange book, to be sure. Told by a man who sneaks into the apartment of a man who has apparently committed suicide earlier that evening, the narrator has some interesting mathematical theories about parabolas, and seems to be relating stories of his past to in some way ‘graph’ them. I’m sure there are other tricks going on in terms of the names of the characters – the main ones all start with the letters A, B, C or D (kind of like labels on points on a geometric diagram). McElroy makes you work for it, in a way like Gaddis; this book has essentially just one ‘chapter break’ over its 307 pages. 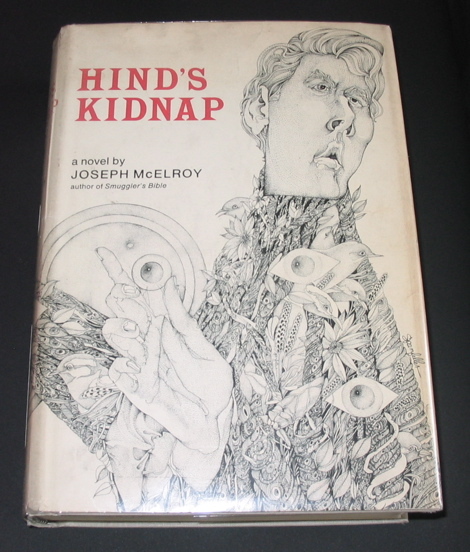 When I’m sufficiently rested from this one, I’ll try his second novel, Hind’s Kidnap. There’s a nice profile of my Congressman, Earl Blumenauer, in today’s NYT. “A Bicycle Evangelist With the Wind Now at His Back” by Cornelia Dean. And as support for cycling grows, he said, builders, the highway construction lobby and others have stopped regarding biking as a “nuisance” and started thinking about how they can do business. In addition, after many attempts, this fall Mr. Blumenauer saw Congress approve his proposal to extend the tax breaks offered for employee parking to employers who encourage biking. 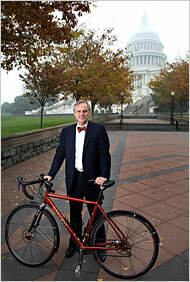 The measure, which Mr. Blumenauer called a matter of “bicycle parity,” was part of a bailout bill. As always, times of crisis are also times of opportunity. I for one am happy to have him pushing in this direction; I think he’s a good representative of the interests of the area.